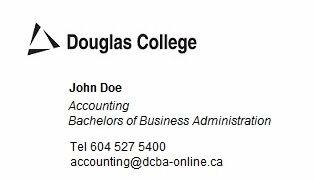 As part of our goal to aid business students in their career paths, the Douglas College Business Association is pleased to be launching a business card service this fall. Why should I purchase business cards? Business cards will give you the opportunity to provide brief career and contact information in professional and social situations where handing out resumes would not feasible. They are an essential job-searching, self-marketing and networking tool. What will the cards look like? Yes! The business cards will have your first and last name, program, major (if applicable), phone contact, and email contact. What if I need them for the CA recruit at the end of September? At this time we will only be accepting cash and cheque payments. How do I pick them up? The DCBA will be setting up additional times when students can pickup their business cards at the DCBA office. We will be contacting students with this information as soon as they are ready. If you have any questions, feel free to contact us at hr@dcba-online.com or call Jonathan Tung at 778-231-2122.